What is a Team folder in box? "Team Folders" are special Box folders that any University faculty, staff member, or graduate student (doing research) may request on behalf of his or her group, unit, or department. Undergrad students are not eligible, though RSOs might be approved. "Team Folders" quotas are separate from any individual customer account. They must have one or more "Stewards" (Co-Owner) who manage the folder file structure and collaborators list. 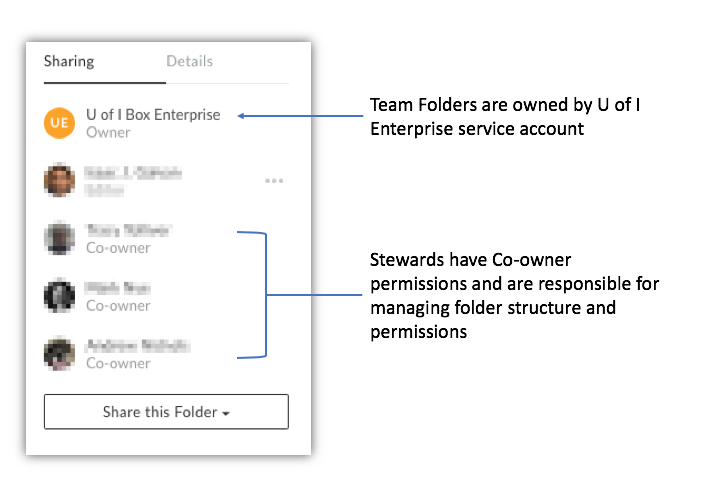 "Team Folders" allow staff and faculty to create archives of department or research group files that are owned by the enterprise, not an individual. Each "Team Folder" has an unlimited quota. Please note they cannot be integrated with any kind of group service like Active Directory.